The American robin is an interesting bird to observe because of its sociable behavior. Robins are most active during the day and typically feed on fruits, berries and worms. Moreover, robins can also be seen as a nuisance, because of their loud chirps, vast numbers and their territorial behavior. For many people, permanently keeping robins away from their homes and gardens can be a challenging, yet rewarding endeavor. Draw and cut out the silhouette of a hawk or owl using cardboard or plywood. Paint the object black and hang it from a high point to scare away robins. It will help deter robins from approaching, as they will view it as a predator and likely leave the area for safety. Hang up bird netting around the fruit shrubs and fruit trees in your garden. Robins typically eat worms early in the day and fruit later in the day. However, they are forced to primarily eat fruit during the cold months when worms are in scarce supply. 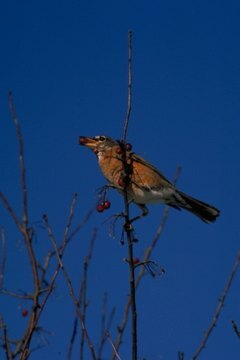 By not allowing robins to feed on available fruit, they will be forced to find fruit elsewhere. Keep curtains and blinds drawn. Robins are naturally attracted to windows because their reflections appears to be a rival robin -- they will charge at it to scare it off. A good way to keep robins away, permanently, is to not allow them to be enticed by their reflection in your window. Move bird feeders away. Robins are typically very friendly birds and can often be seen feeding from a bird feeder. Remove your bird feeder to discourage robins from loitering in the area. Plant grass or sod over exposed dirt. The availability of mud at nesting time may entice robins to nest nearby. Don't encourage them to nest by providing them with this nest-building resource.